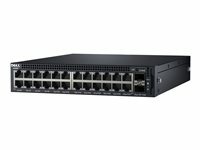 HPE OfficeConnect 1820-24G J9980A 24 Port Gigabit devices are basic, smart-managed, fixed-configuration Gigabit Ethernet Layer 2 switches designed for small businesses looking for key features in an easy-to-administer solution. 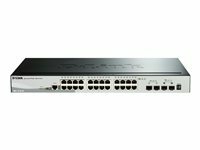 The HPE 1820-24G J9980A 24 Port Smart Managed Switch offers more choice and flexibility for smaller organisations that require ease of use and lower Total Cost of Ownership (TCO), while delivering better network performance. They are smart-managed, fixed configuration, Gigabit Ethernet Layer 2 switches in an easy-to-administer solution that have the latest energy-saving capabilities. These switches are plug-and-play out of the box, where network operation can be fine-tuned through features available from a simple Web browser-based GUI, when needed. Two non combo Gigabit SFP ports for fibre connectivity. The HPE 1820-24G Switch features an intuitive Web management interface with an enhanced navigation pane for easy management of devices by non-technical users, ideal for organisations that require simplicity. Customisable features include VLANs, Spanning Tree, Link aggregation trunking, and IGMP Snooping. All models include Rapid Spanning Tree Protocol (RSTP) and DSCP QoS policies. The HPE 1820-24G Switch traffic prioritisation provides time sensitive packets (like VoIP and video) with priority over other traffic based on DSCP or IEEE 802.1p classification. Packets are mapped to eight hardware queues for more effective throughput.